The Weekend Gourmet: Glade Limited Edition Winter Fragrance Collection...and Peppermint Bark Brookies! Glade Limited Edition Winter Fragrance Collection...and Peppermint Bark Brookies! In honor of Patience Brewster's 2014 online cookie exchange here is my Peppermint Bark Brookies recipe. Patience Brewster is a artist and designer of holiday ornaments and figurines. December is my favorite month of the year...the sights and smells of the holidays always seem to evoke happiness and smiles in my home! Glade recently sent me a few items from their Limited Edition Winter Fragrance Collection to try out in my home. All of the scents are perfect for the holiday season...but my two favorite items are the Sparkling Spruce™ Glade® PlugIns® Scented Oil Warmer and the Frosted Cookie Party Jarred Candle. Simply plug in or light, and you've got instant holiday cheer within minutes. We have an artificial tree in our living room, but the natural pine fragrance of the Sparkling Spruce PlugIn provides the perfect Christmas tree scent. I love walking into my living room and smelling the scent of pine, eucalyptus, cedar, and patchouli. It instantly puts me in a festive mood -- the scent of pine, without having to deal with pine needles! 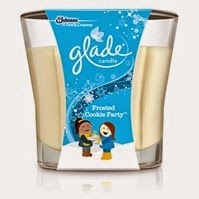 I also love to light the Frosted Cookie Party candle -- it smells just like cookies baking in the oven. The scent is cozy and comforting...and it makes me want to get into the kitchen and bake! Inspired by the candle's vanilla and marshmallow scent, I went into my kitchen and whipped a perfect -- and easy -- holiday cookie. My Peppermint Bark Brookies combine two of my favorite flavors: peppermint and chocolate into an irresistible treat. The cookies are made using Ghirardelli Double Chocolate brownie mix, which includes chocolate chips. The brookies bake up moist and fudgy...and my addition of peppermint mini marshmallows adds a dash of fun. After cooling, the brookies are dipped in white chocolate and sprinkled with crushed peppermint. For peppermint lovers like me, these are the ultimate holiday cookie! Step 1: Preheat oven to 350. Line a rimmed baking sheet with parchment or a Silpat; set aside. Add the brownie mix, flour, eggs, peppermint extract, and vegetable oil to a large mixing bowl. Stir with a sturdy spatula or spoon until combined. Add the marshmallows and fold in until evenly distributed in the dough. Step 2: Scoop the cookie dough with a small cookie scoop and place approximately 2 inches apart on the prepared cookie sheet. The cookies spread a bit during baking, so give them room. Cook for approximately 10 minutes, until baked. Let the brookies cool on the cookie sheet for at least 5 minutes before removing -- otherwise, they won't keep their shape. Step 3: Let the brookies completely cool -- at least 1 hour. When the cookies are cooled, place the white chocolate and oil in a deep bowl. Microwave approximately 3 minutes, until melted. Stop halfway through to give the white chocolate a stir and to prevent scorching. Dip half of each brookie in the white chocolate and place on foil or parchment. Sprinkle with crushed peppermint sticks. To speed up the process of setting the white chocolate, set the cookies in the fridge. These brookies are a peppermint lover's dream come true! The brookies are fudgy like a brownie, with pockets of melted chocolate and peppermint-infused marshmallow. The peppermint bark coating works perfectly, making this treat a hybrid of holiday candy...and cookie. I can't wait to share these with my co-workers tomorrow. I hope you'll give these a try...while you enjoy the holiday scents of Glade's Winter Scent Collection. Disclosure: Glade provided with samples of their Limited Edition Winter Collection of scents to serve as inspiration for creating a holiday recipe. All opinions are solely my own.